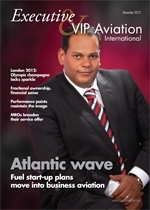 This issue sees Anthony Harrington taking on the reins as new Editor of Executive & VIP Aviation International. Martin Roebuck has done a splendid job as editor to this point and we look forward to taking the journal to new heights – no pun intended – through 2013 and beyond. Advanced economies are at last starting (one hopes!) to gather momentum after the greatest financial crash since the Great Depression of the 1930s and that will be welcomed by all. Having charted a course through the difficult years since the collapse of Lehman Brothers, the business and private aviation sector is well positioned to benefit from any upturn in Western economies. Emerging markets hold out exciting prospects as well as challenges for the sector and we will be following developments in Asia and Latin America with great interest in the year ahead. As always, we welcome your views and ideas regarding content and coverage. Feel free to drop us an email or call us at your convenience. Being a proud member of Middle East Business Aviation Association (MEBAA), Atlantic FuelEx will sponsor MEBA 2014 (Middle East Business Aviation), which brings together the key buyers and decision makers in the international aviation industry. It offers a never before accessibility into the region’s aerospace market. With over 6200 trade visitors, 55 static aircraft displays and 338 exhibitors seen at the last show, this year MEBA launches its sixth edition from 8th to 10th of December. Atlantic FuelEx works with MEBAA on issues and affairs of the aviation businesses operating throughout the Middle East and North Africa region. Industry specific exhibitions are always a great way to enter into new lucrative markets. Atlantic FuelEx is getting ready to participate at the Expo Aero Brasil – the only kind of its show in region for the aviation industry. Being a cherished member of Expo Aero Brazil, Atlantic FuelEx aims to take its business service solutions to the Latin American countries. The Expo Aero Brasil, otherwise known as the International Fair of Aeronautics, is a vibrant platform for the launch of aviation equipment and services for national and international companies, exhibition and sale of aircrafts, and a happening place for professional aviators to meet up and network. Atlantic FuelEx is a staunch industrial partner of Arab Air Carriers Organization (AACO) – a regional association which is committed to serve the Arab airlines and promoting the industry’s best practices. Being an active member of AACO, Atlantic FuelEx is in the front line in representing the common interests of the regional business aviation community. AACO provides a common platform for networking between the members, and is instrumental in improving bilateral contacts between suppliers and AACO member airlines. Furthermore, AACO works as a catalyst to improve cooperation within the community members and help them achieve tangible economic benefits, cost reduction and maximum revenue generation.